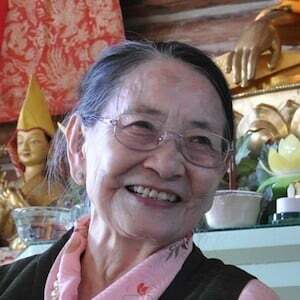 Dagmo Kusho Sakya—affectionately known as Dagmo-la by her students— has taught twice at Sravasti Abbey, conferring initiation and inspiring practitioners to bring Dharma in their daily lives. Dagmo-la was born in Kham, Eastern Tibet. As the niece of one of the most highly realized Sakya masters of the twentieth century, H.E. Deshung Rinpoche III, she had unusual access to Buddhist training and began studying at an early age. On a pilgrimage to Sakya, the headquarters of one of the four major orders of Tibetan Buddhism, she met her future husband, His Holiness Jigdal Dagchen Sakya Rinpoche, who was being prepared to become the Head Lama of the Sakya Order. Upon marriage, Dagmo Kusho Sakya accepted the heavy responsibilities of entering the ranks of Tibetan nobility and of representing the ancient tradition of this spiritual lineage. She tells the story of her youth, marriage, and harrowing escape from Tibet in the beautiful autobiography, Princess in the Land of Snows . With her husband, the late Dagchen Rinpoche, Dagmo Kusho founded what became the Sakya Monastery in 1974 in Seattle, where she still resides. Dagmo-la regularly bestows empowerments and teaches at Sakya Monastery. She founded the Tara Ling Center in Pasadena, California, and has established centers in Kona, Hawaii; Flagstaff, Arizona; and Mexico City. Read H. E. Dagmo Kusho’s thoughts on the Abbey. View photos of one of her visits.